It’s January, and it really feels like winter now that the temperature is consistently chilly and snow is in the forecast. Cold weather brings with it sniffles and runny noses, but did you ever wonder why? The nose performs an important job – warming and humidifying the air breathed in before it gets to the lungs. When the air inhaled is very cold, it’s usually also dry, so the nose has to add extra moisture. The small amounts of moisture produced combine into droplets that then drip from the nose. This is called rhinorrhea. In the case of the common cold, the nose is also functioning to help fend off the infection. 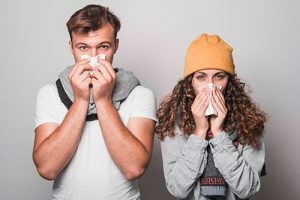 When a cold causes a runny nose, the mucus membranes inside the nose are producing mucus and fluid to help fight off the germs and wash them away. Similarly, when a person is exposed to allergenic substances like pollen, dust or other irritants, the nose acts to produce more mucus to help rid the body of the offending allergens. If your runny nose doesn’t seem to be going away, it could be an indicator of seasonal or year-round allergies. A board-certified Allergist specializes in the diagnosis and treatment of allergies, asthma, and immunology and is the optimal choice when seeking a provider for these types of conditions.